This morning Long Lake was starting to form a skin of ice on the water near the shore. I went out to take a few pictures. When I looked at them I saw 2 birds up in the trees on Breezy Point. So I cropped this picture from the telephoto picture I took. I didn’t realize that the eagles (or I think they are eagles) were there. You can see the slight skin of ice forming on the water in the foreground. 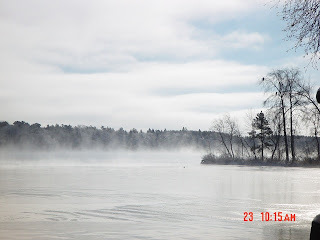 In the other picture you can see the steam rising from the warmer lake water. The temperature in Park Rapids this morning was just below zero. 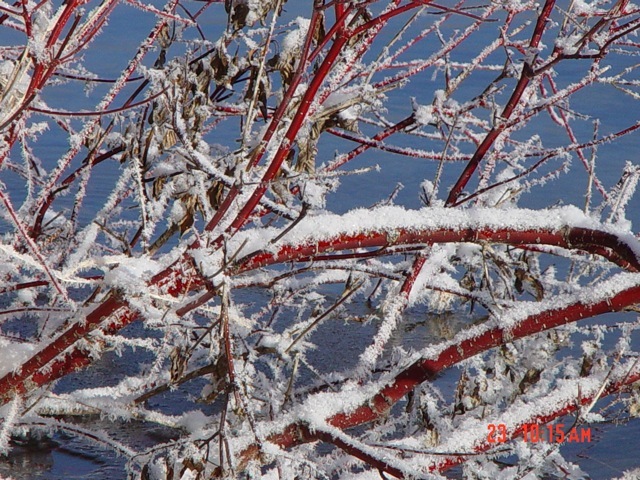 Thanks for sharing these three great winter shots, CC. I especially like the snow covered red branches against the blue sky.